Brian has been with McHenry County College since 2012 and most recently took on the interim role of Executive Director of Friends of McHenry County College Foundation (“Foundation”). In this position, Brian will provide leadership and management in fundraising to the Foundation and college-wide operations and work closely with the Foundation Board to plan and implement fundraising efforts to support college needs. Prior to taking this position Brian was a Business Specialist at the Illinois Small Business Development Center at McHenry County College. Here, Brian provided coaching and counseling to both start-up and existing business that helped generate the enthusiasm and clarity of vision needed to ignite their growth initiatives. This work primarily focused on developing both leadership skills and a comprehensive business plan. His experience also includes leading the organization and start-up of a local community bank and serving as its President and CEO for 10 years. In that role, Brian drafted the comprehensive business plan and raised over $4 million in start-up capital. Other work experience includes serving as Vice President of Commercial Lending for Harris Bank, Credit Analyst for Transamerica Commercial Finance and Management Associate/Credit Analyst for LaSalle National Bank. Brian graduated from The University of Notre Dame with a B.B.A. in Finance and also holds a M.B.A. from Northern Illinois University. 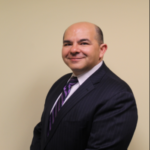 He has been actively involved in the community serving on the board of directors for the Chamber of Commerce, Education Foundation, Lion’s Club, Economic Development Corporation, and Centegra Foundation. He also served as a Regional Director for the Community Bankers Association of Illinois. He is a Big Brother for Big Brothers Big Sisters of McHenry County and is a 2013 graduate of Leadership Greater McHenry County (LGMC), where he currently serves as a board member. Brian is a life-long Marengo resident and currently resides there with his daughter, Sophia. LGMC is a 501c(3) nonprofit organization. All donations are tax deductible to the extent allowed by the law. © 2019 Leadership Greater McHenry County. All rights reserved.